There was lots of counting and 1:1 correspondence going on while we made these ice blocks. Thomas loves counting. He often initiates counting activities when we are playing. He counted the pieces of pineapple as he put them into the blender. Thomas is currently looking to take a bit more responsibility in the kitchen so I have been helping him use a blunt knife to cut up fruit. He is enjoying this new (developing) independence. 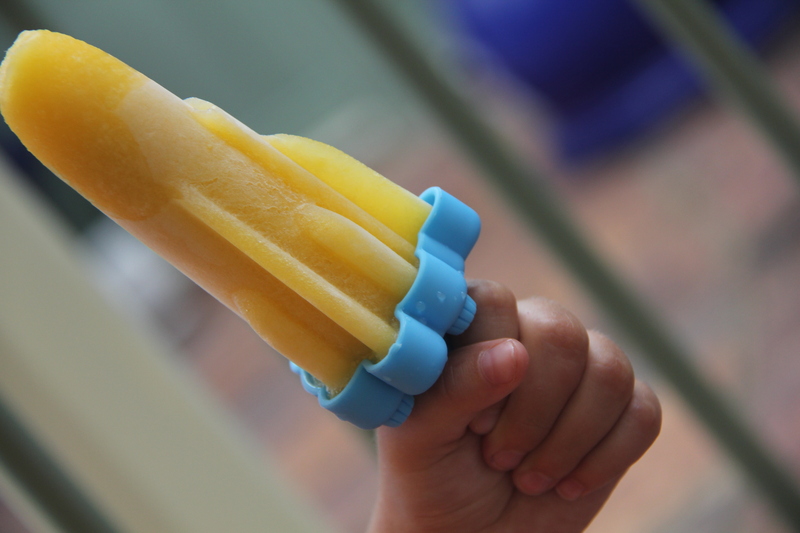 Thomas LOVES lemonade so I thought these ice blocks would go down well. Place pineapple and mango in a food processor or blender. Blend or process until smooth. Remove to a jug. Add lemonade. Stir to combine. Pour mixture into moulds. Insert paddle pop sticks or secure with lids. Freeze until set. Remove ice-blocks from moulds. Serve.This recipe made approximately 9 half cup ice blocks. They were delicious.I am enjoying making ice blocks at the moment. It’s a great way to get a bit of extra fruit in children’s diets whilst having a bit of fun in summer! Thomas loves anything with berries or berries by themselves. He can’t get enough. He ate a whole punnet of blueberries this morning by himself. I think he’s going to look like a blueberry soon! I’ve been meaning to make some more ice blocks for a while and we’ve had some hot weather the past couple of days so this morning seemed like a good time for it. Thomas really enjoyed helping me make these. They were quick and easy – simple enough for little ones to make with some assistance. Thomas helped me squeeze the oranges (good for developing fine motor skills) and counted out the strawberries (basic maths skills and 1 to 1 correspondence), measured the blueberries and raspberries (basic maths – measurement) and helped to pour the ice blocks into the moulds (hand eye co-ordination). His favourite bit was putting the sticks in the moulds – he was very excited when we put them in the freezer! Place all ingredients in a blender and blend until smooth. Strain mixture into a jug (not necessary) and pour into ice block moulds. Place in freezer for approximately 4 hours or until frozen. 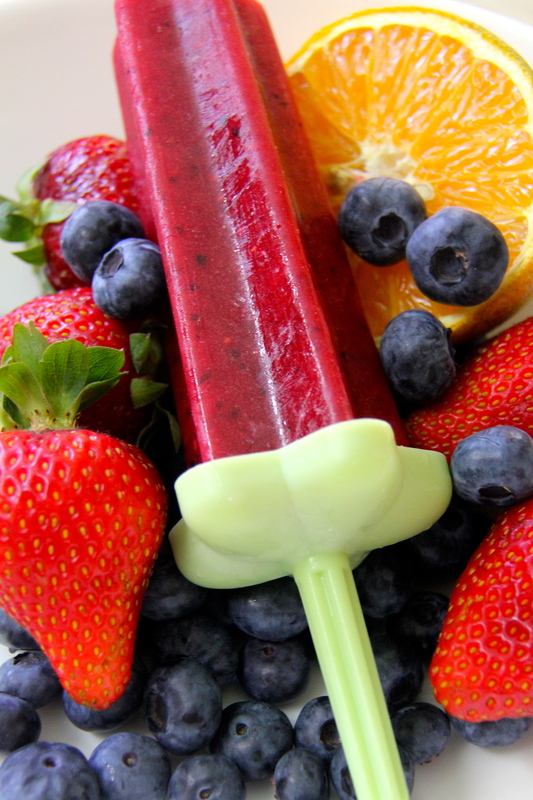 Do you have any homemade ice block recipes that your kids enjoy? I’d love you to share them!